LG model LFX23961ST doesnt blow cold air to fridge when you close the freezer.. wow..I'm stumped or stupid..I've gone through every inch of this fridge and can not bring myself to think its a computer problem. The damper is open, actually took the duct vent away to check. All vents are clear..No ICE buildup what so ever and the fans are working very strong. When ever I shut the bottom freezer door, the cold air to the fridge stops blowing into it. The fan is working when I do this! The return air vent has been steamed and is getting proper air flow..Its a LG LFX23961ST french door model..Any suggestions?..Thanks! Re: LG model LFX23961ST doesnt blow cold air to fridge when you close the freezer.. Does it beep as if a door is left open? You may have your alarm turned off. So if you open the freezer drawer, and hold in the door switches, you have airflow to your fresh food section? And if yes, you close the door to find it not allowing proper air flow? If all ducting is clear, I would ensure your freezer switch is operating properly. So keep the tape on the switch and close the door. If airflow does stop I would still believe return air has a block somewhere. If the airflow is fine with switch taped closed that tells me your circuitry is fine. The only thing that happens when that door is closed with switch taped shut is seals the box. The only option is airflow. Theres two ports on the bottom floor of the fridge and comes out in the freezer..Im assuming thats the cold air return. I shot steam through it and really couldnt tell if it helped, but it was flowing through..How else can I check the vent?..Doesnt look like any kind of access..Thanks! Simply as lifting the left side of the evaporator and let the steam flow up into the fridge. That is the way I am familiar with. Do you have any additional info? The fresh food airflow will not be as powerful as the freezer but is able to be felt by your hand easily. Just open the freezer and feel the flow out of the fresh food venting? What was the series of events causing you to tear into this fridge. When you opened the freezer door and the refrigerator door, you allowed the air to circulate from the freezer to the refrigerator through the vents. Once you closed the freezer door, the blocked return vents stops the air flow. That's a definite sign of a frozen return vent behind the evaporator coil in the freezer. You need to pull out the "false" wall inside the freezer and lift up the evaporator to expose the return air vents just behind it. Use your steamer to clean out all the of the ice build up. 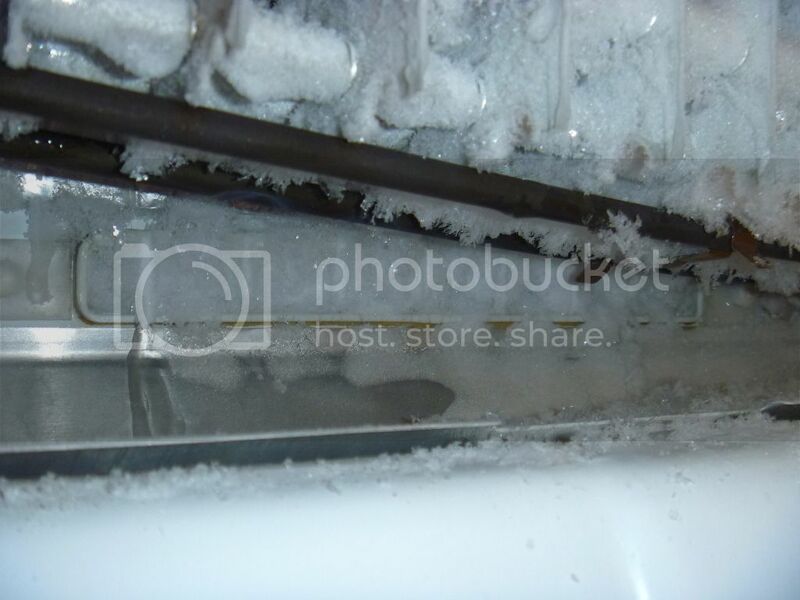 The reason for the ice build up is because the refrigerator door was left open partially for a period of time and caused a severe ice buildup inside the evaporator area. If you don't want to pull this apart, you can pull the plug and leave the freezer drawer open for 48 hours. That should give it enough time to melt the ice build up inside the evaporator.